At Family Dental Clinic West End we believe that prevention is better than cure. That is why we recommend regular dental visits to maintain existing treatment and prevent future problems from arising. However we understand dental emergencies do occur at any time, therefore we set aside emergency appointments for patients requiring emergency treatment. The practice is also open every second Saturday to allow more convenience for patients. If you have a dental emergency we recommend calling the practice as soon as possible to secure an appointment time. If you are experiencing a dental emergency, broken tooth or tooth ache please do not hesitate to contact us on 3844 8606. In case of after-hours assistance you may call Dr Sam Hadjipetrou on 0418 190 554. If you do have a dental emergency overnight or outside business hours there are still things you can do. A toothache can occur anytime and anywhere and can become very intense quickly. If you do experience a toothache we recommend not to leave it in hope it will get better. There can be underlining reasons for your toothache and can become worse if left untreated. Therefore it is best to call us as soon as possible to arrange an appointment. Once we examine the tooth our dentists will endeavour to relieve you of pain and provide you with all treatment options for the tooth. 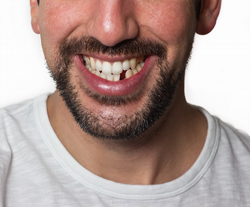 If during a sporting game or accident a tooth is knocked out it is essential to come see us as soon as possible. Avoid touching the root of the tooth and pick up by the crown. The first step if possible is to carefully and gently remove any visible debris without major disturbance to tissue attached to root. Secondly, if the tooth needs to be washed the best option is to use saline (sterile salty water) from a chemist. If unable to find a chemist, milk is the next best option. Lastly if can place back into socket ensure to orientate and seat correctly asap. Hold the tooth in position with either gently biting on a cotton gauze. Seek dentist for treatment such as harder/firmer splinting. If unable to seat the tooth, gently store in glad wrap and bring to dentist. Once at your appointment we will examine the area and try to save the tooth. If the tooth is unable to be saved our dentist will run through with you options of replacement. If you experience a broken tooth, it is important that we see you as soon as possible to avoid the start of infection and further breakages. Even if the tooth is not causing you any pain, the sooner we see you the less chance of problems developing. Wisdom tooth pain can happen spontaneously and can become quite severe. It is important to continue to brush the area well in case of food trapping and rinse with warm salty water. At your appointment our dentist will examine the tooth and may take a full mouth x-ray with our OPG machine. From there we can advise you of your treatment options. There are things you can do to prevent emergencies from occurring. To maintain your existing treatment and prevent future problems or emergencies from arising we recommend brushing your teeth twice daily and flossing once a day. Home maintenance combined with 6 monthly professional cleaning will keep your gums healthy and your teeth happy.